Dr. Séverine Deneulin, Lecturer in International Development, Department of Social Policy, University of Bath, UK. The question of the meaning of progress and development is back on the political agenda. How to frame this discontent and search for new alternatives when either Marxism or liberalism no longer provides a satisfactory framework? This book introduces in an accessible way the capability approach, first articulated by Amartya Sen in the early 1980s. 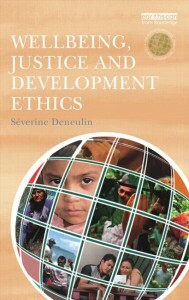 Written for an international audience, but rooted in the Latin American reality - a region with a history of movements for social justice - the book argues that the capability approach provides to date, the most encompassing and compelling ethical framework with which to construct action for improving people’s wellbeing and reducing injustices in the world. This book outlines in a clear and concrete way what the capability approach is and its significance for the social sciences and policy. It describes the distinctiveness of the approach as an ethical framework for action and aims to stimulate critical reflection on current economic and social practices as well as providing a language with which to modify them within human wellbeing concerns. Comprehensive, practical and nuanced in its treatment of the capability approach, this highly original volume gives students, researchers and professionals in the field of development an innovative framing of the capability approach as a 'language' for action and provides specific examples of how it has made a difference.